In Perth or Freo? 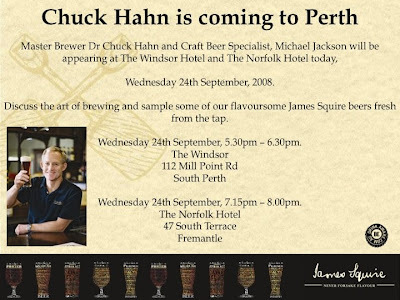 Fancy a beer with Chuck Hahn tonight Weds 24th Sept? Following James Squires recent nationwide Chefs Match beer and food event, Mr Chuck Hahn is back in Perth this month for more beer and food matching delights. Visit the Windsor Hotel on Mill Point Rd,South Perth on Wednesday 24th September for the Windsor Indian Food Fair, where you can experience a selection of exotic dishes from their Indian chefs partnered with the distinctive brews from the James Squire stable. Your host for the evening Dr. Chuck Hahn, Master Brewer will take you on an exotic food & beer journey. Commencing at 7.30 pm tickets are $70.00 per head with Bookings essential by phoning Kim on 08 94742229. The following evening, Thursday 25th September, why not head to Origins Restaurant, The Sheraton, Perth for a Five Course Degustation Menu. In partnership with James Squire and Sheraton Perth Hotel the creative, contemporary cuisine prepared by Sheraton's Chef De Cuisine, Travis Collins and his expert culinary team will be paired with the unique tastes of James Squire, in a dinner hosted by Master Brewer Dr .Chuck Hahn from the Malt Shovel Brewery. "designed not only for lovers of a good ale, but those who are also interested in finding the beer that's right for them..."
Enjoy a five course degustation menu, each dish featuring the freshest West Australian sourced produce and has been matched with sensational James Squire Beer. $85 per person: Bookings essential, Please phone 08 9224 7734. Its time for a quick round up of whats going on in the WA brewing scene, where the big boys of micro brewing are experiencing some tough financial times. Two of the more recent additions, Empire and Oz Brewing have exited from their interests in Colonial Brewing and Mad Monk. Empire, who were looking to create economies of scale through a multi-venue hospitality operation, have sold up The Royal in East Perth and the Colonial Brewing Co in Margaret River to Colonial Leisure Group Pty Ltd for an estimated $4.5 million. Whilst Oz Brewing Ltd have sold their 49% in relative newcomers, Mad Monk in Fremantle, with an option to acquire 100% of the asset. Gage Roads posted a net loss after tax of $3.62 million, compared with $3.07 million loss in 07, yet remain upbeat about the challenges ahead and are hoping a new distribution agreement with VOK Beverages will improve their presence in eastern markets. To support the push, Gage Roads also hope to launch two new high volume products in the current financial year, including a low carb beer set for release next month. Two ciders area also in the pipeline. Little Creatures continue to buck these trends and forge ahead with their astounding success. Net Profit annually was up 14% to $3.41 million, as the brewer completes its plant expansion plans in Fremantle, opens its first Melbourne venue in Brunswick St, Fitzroy and constructs a new brewing facility on the 'Giant Steps' vineyard in the Yarra Valley - where they hope to develop a new brand. And if you visit either the Freo or Fitzroy venues you can now purchase 'mix & match' cartons of the brewers four beer core range - that's a six pack each of Pale, Pils, Bright & Rogers - so there is something for every one. In the Perth northern suburbs, Indian Ocean Brewhaus are celebrating a win at the Australian Hotels Association Awards for Excellence in Sydney, having been voted Australia's Best New Redeveloped Venue! A great lead in for a busy Oktoberfest period and the re-scheduled Indi International Beer Dinner on Friday 3rd October (Bookings Essential 9400 1187). Out in the Valley, Duckstein announce the availability of a Duckstein 5L minikeg to take home and share with friends. The elegantly presented label features the artwork of Nannup artist Marion Duke and depicts the lansdcape of Saracen Estates, Margaret River. This first run of Pilsner is available for a limited time only. Spring in the Valley is always a busy time for the Valley's original brewery and this year on The 11th & 12th of October will be no different, with around 60,000 people soaking up the wonderful atmosphere and sampling the delights of the Swan Valley. The Duckstein Brewery will again be commencing Oktoberfest celebrations with live music from the Dolomiten German Polka Band, Alan McGowat's Band and a cool DJ. The festivities kickoff at 11am, with FREE entry on a first-come, first-served basis. On Saturday 25th October they are having a special Oktoberfest party featuring live music all day and into the night; The Dolomiten Polka Band, Nancy & Christa's German Duo and some popular music from Alan the Music Man. Festivities commence at 11am and traditional German singing and dancing will be the order of the day. A special Oktoberfest Beer has been prepared for the occasion. Bookings are highly recommended. If you are driving along Caves Rd in Margaret River and catch a waft of malt and hops it's because they have started brewing!- although, unfortunately it won't be ready to drink until late-October. Watch this space for news of the impending opening. Thats all for now folks, keep an eye out for more updates coming soon. And remember, you can subscribe direct to this blog via RSS or read any updates on our facebook page.